He and his wife – classical musician Fionnuala Hunt – are both committed Francophiles and they fulfilled the dream of many almost a decade ago: that of buying a home in France. Their local boulangerie is, he says, an excellent example of French baking prowess. They normally travel to their home in France by car in the summer, driving down from Cherbourg and then spending most of July and August in France. They’re planning on spending some more time there over the winter, flying from Dublin to Lyon. With Raymond’s work, he ends up travelling over on other occasions during the year; these would include harvest festivals and the local event in January called the Saint Vincent Tournante. “, which he launched in 2014 to very positive reaction. The legalities involved in buying the house were made all the more smooth, Raymond says, by Dublin-based solicitor Ivan Healy of Beatty Healy Solicitors. Ivan is a fluent French speaker and one of the few solicitors operating in Ireland holding a Diplôme de Français Juridique (awarded by the Paris Chamber of Commerce). Along with Bordeaux, the Burgundy region is one of the prime wine regions of France. That is not to say, however, that Bordeaux wine is all big business and no heart. Nor is it to say that Burgundy is all small holdings of contented farmers making very little profit. “It’s more to do with scale rather than levels of industrialisation,” the former Clongowes Wood teacher clarifies. “For example, a highly-regarded Bordeaux Château might be 80 hectares in size. That sort of scale would be unheard-of in Burgundy – there’s no equivalent. The big négociants – the traders – might have that in total but it could be scattered over dozens of different plots. 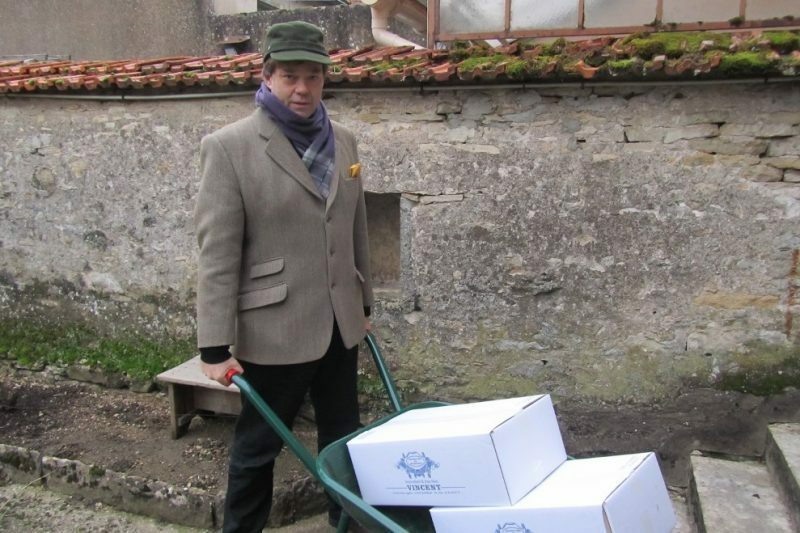 So the whole structure of the business is different, but a quality-conscience producer in Bordeaux is going to be producing excellent wine – there’s no question of that. Raymond isn’t the only one to notice the quality of Burgundy wine and prices for all wines in the region have gone through the roof in recent years – a trend that’s showing no signs of letting up as the image of the Bourgogne bottle continues to enjoy its hard-earned reputation for locally owned quality. Raymond and Fionnuala have immersed themselves enthusiastically into life in Burgundy and have made many friends. Some Irish people suffer from the difficulty of making friends less easily when they are abroad and making friends in France is sometimes painted as a task that requires more effort than in other countries. What has his experience been on that front? “I’ve had a lot of time to reflect on this… The French are more reserved (than Irish people), but not colder. In fact, I find French people to be formally polite. For instance with our next-door neighbours Joël and Patricia – who are now great pals and I couldn’t speak too highly of them – whenever I bump into them for the first time in the day, you can’t start talking until you’ve shaken hands or given each other the peck on the cheek; until you’ve formally acknowledged one another. You simply cannot start a conversation until you’ve done that. There’s a formal politeness there that’s sometimes, I think, misinterpreted as frostiness. But certainly, the people we’ve met have been fantastic – absolutely fabulous! Raymond’s immersion into local life saw him become a Chevalier du Tastevin. Just what is that and how does one go about becoming one? “What happened was that as soon as we had bought the house, one of the producers I know from visiting the area said ‘Oh, we must put your name forward for Chevalier now that you’re here and you’ve put your money where your mouth is’. So that’s how it came about. In fact it happened just nine years ago so it was a great celebration and honour. As for the language, Raymond admits to a terrible laziness when it comes to achieving full fluency: he’s not there yet, he says. For more from Raymond on wine, humour and buying a house in France, see his Blake on Wine blog or click on the link below to see how to order a copy of his book “Breakfast in Burgundy: A Hungry Irishman in the Belly of France”.